Sanguineti is a well-known name among Ligurian and National accessory firms and has gradually brought onto the old activity all new required by yards and owners today. We manufacture pleasure accessories. I mean, we produce and let produce internal and external handling equipments, deck hardware - we made up all fittings aboard "Destriero" and designed deck, hauling. -, for items on request we've looked for a firm used to manufacturing high - light materials. So, is there a greatly specific tech - in - put in it? I mean, is there a range of diversified products appropriate for a vintage yacht, for an offshore or for a classic motor yacht? Yes, it's right. Our most important question is having and selling the appropriate product for the right yacht. Sometimes, this isn't immediately within our reach. 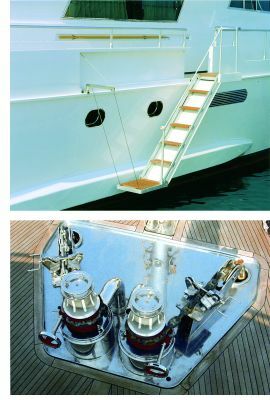 I've a great deal of ladders, I am asked for a ladder appropriate for a 24 - 25m, but I find out later the yacht is a 50m. This small gangway leaning right here cannot get out of the transom, indeed. We've changed it. Thanks to our organization we've been great able to provide a more appropriate one and right soon, it's possible to choose. If you get to Monaco, there's a wonderful 80m named "Delphine": The gangway is by us, the capstans were original, sent to us; however, we've put them away and made a new hydraulic system for them. We've done the same on board "Skagerrat" the old Hitler's yacht. If you get on board, there're no capstans there; only the barrel of is there, but the yacht's a great gangway, indeed, very different from that of a 30 - 20 footer. We always need to match item and yacht. We work actually on providing a full service; so we collaborate with engineering departments and I'm already working at a yacht that might come out in one or two years. I'm a mechanical engineer, so I'm not a competitor, I cannot sign a yacht. I'll never copy and sell drawings I looked at to others. I'm always a partner. To say nothing of adapting, interfacing aboard a yacht in order to shape her personality. Below there it's a small up/down bridge, did you see it? So, it gets away tomorrow. to Ostia, to Canados. Now I'm making a two - ton one that'll house a greater dinghy on it. So, do you give attention to all new technologies too? Either in raw materials or in assembly? Well, we've made great strides in managing materials. I mean light alloy. We adopt a greater different design for it as in the past, since we set with a hydraulic machine now. This has allowed us to suite all designs to this type of cut. If you look at the bridge right below us, you can say it's welded, sure, but if you brush away welds, you can look, it remains stiff bonded, because it's joint in already predrilled inserts. So we've no problem with welds; they don't crack being over a so self - bearing joint system. We've developed it over the years. We work in the peak season mainly answering to whichever ask, but meanwhile there're wholly new projects, ideas, products that'll be developing after the hardest seasonal work ends as well as innovations to soak up. A yard's recently asked me for telescopic arms taking a net outside, since on the third deck of a about 60m yacht people usually play golf and want a system avoiding balls falling into the sea. I sent the drawings of these electric arms to the yard right yesterday. We've also made ladders that allow dogs to go swimming: some owners want to go swimming with their dogs. A dog has no foot, indeed, but he needs enough space to put his paws on, anyway. By changing the step inclination, I've made an appropriate ladder for dogs. You're speaking about ladders, gangways. Do you realize lifts for disabled too? Yes, of course. We've also made one aboard a 40m. The owner living on board wanted to get on by a wheelchair, but on yacht of this size a normal lift requiring an half metre of space around it to go up/down cannot be set up. On a moving yacht counterweights are to be avoided too. So, there're a lot of things to taken into account. Well, there're actually lots competitors; but it isn't an easy work because the sun actually acts on colours and dimensions. There're problems not immediately visible to deal with, but we try to manage them, anyway, doing our best. Some people work at lower costs so I was said: "He sells for less" and I: "Buy a cheaper one. If it's the same to you, no problem." We must always work at the top on our and worker's ability. They are skilled workers, but if we say them: "This is wrong. Do it once more, please" they do it again. So, people grow showing attention to detail. Or, if we say them: "Hurry up, we've to finish ten of them by evening" the work goes on in a very different way. We've a lot of work, but before summer vacation we'll be carrying out all new programmes. Are you at the top of your capability today? Well, all developments are wholly entrusted to our Engineering Department, so we can manage a bit work more. How much time does take designing a new tender - ladder system? Thanks to our experience, the idea comes soon. but on board a yacht of this size the problem is actually realizing it properly and this takes a lot of time, sometimes a lot of months. First, we've to get on with the customer. For example, there's an owner who's getting his new 50m built by Chinese. Since the Genoa Boat Show we've been still defining the design of the side ladder. The Chinese have spoken him of a 42cm one. But I've said: - Mister, I don't make a 42cm ladder on board a 50m, anyway. You'd have a small toy and someone should say to you then: - Who did make it?!? - Please, say them to give you more space for, it'd be impossible to fit up on board a 50m a so miserable ladder. This is an object that makes a yacht handsome, indeed. When you're on mooring, guests get on through the side ladder and visit you. . And would you let them on a so object? This choice, a so small ladder wholly drilled perhaps without wood but with a few carbon in it goes better with an offshore. So, these are the problems we've to face daily and we've also to provide an appropriate customer service for, when all works well, of course. Are you already organized for? Yes, of course. We've service points in the main places and a warehouse with quite all spare parts. Can you, however, provide a very speedy service? Yes, by Traco we send something that'll be received the morning after. On Monday morning we've in Viareggio a 40m with a '97 crane lowering a bit under load: - She must sail - I was told - but, before leaving, get someone to come, please. And we'll be there on time, of course. We get to, it being a service due, not something for making money, indeed. Sold something the fatherhood of always remains. You want always to cut a fine figure; I mean an object fitted up on board should always be a visit card. Yes, this is our sprit of work, but over the years it depends on how proper an owner keep his yacht in order. And the great deal of work we do shows that. We're working at a lot of yachts at the moment. When you receive an order, do you aim for manufacturing the whole hardware or only somewhat you prefer? Well, we try to supply as much as possible. Managing an entire yacht is better easy. Do you work at the top at everything you do? Yes, of course. But a structure, namely an appropriate organization is needed to do that; people who spend money want and must have the best. There're fewer unwary as in the past today. An owner counts on a surveyor to check up all the work including subcontractors. They look actually to a structure, mainly. A few times ago a Britain came and with typical British humour: "I've visited a workshop - he told - to order a gangway; there're two workers and a dog. The dog had a shrewd look, indeed, but should the two workers have obeyed him?" Quite aside from the quip this work requires a reliable structure and the capacity of always going on, of thinking up new ideas. We suite customers, but we anticipate them too. Do you work together with great series manufacturing shipyards? Yes, we usually work for shipyards like Benetti, Codecasa, Robel Marine, Arno, Christensen, Palmer & Johnson. Well, we seek for yards looking to top standards. As an owner asks us where he can buy a ladder, I say him. - Mister, buy a second - hand one. From its price you know right what you're buying, the real worth of it. You must actually look at price, warranty period, so at restoring and operating costs. We're probably people who swim against the stream of a market leading to cheaper and cheaper items that give customers less and less. However, I think we'd do more than usual; people who can afford to buy something enjoy actually doing that. Also a car windscreen is of plastic and plastic. We're one of the few firms, perhaps the only one that works on drawings of winches approved by Lloyd's, this being as greatly other as the approval by the workshop, indeed. The Lloyd's require braking trials data and other features making an item special. We've just made these door hinges with four levers, so a door starts opening in plane by changing only a bit the position of their pins. I ever saw nothing of sort. Moreover, the door can be hauled greatly high, whilst sometimes the space's too small to allow someone to stand under. So we can open well - high doors also aboard a yacht.